The seven short cinematic pieces here together barely top the 18 minute mark but pack plenty of emotion and feelings of solitude and introspection. 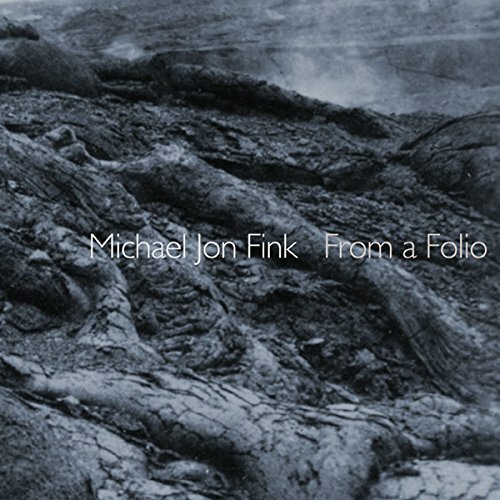 Fink is a Los Angeles based composer who has been active for decades, his music appearing on seven previous Cold Blue releases, and numerous releases on at least seven other labels. The instrumentation employed on From a Folio is sparse but fits the scene perfectly, like a recipe for tranquility; Fink plays piano, and is accompanied by cellist Derek Stein, and with the exception of one piece with no piano where cellos are multi-tracked, the general approach is with piano leading in a slow and deliberative way, with a single cello augmenting the proceedings with additional coloration and melody, albeit dark and heavily shaded in introverted moods and mystery. All taken together, this is an exceptional collection of vignettes conveying a single serene experience. Sure, it’s barely an album side in length, yet if it were longer it might easily become too absorbed and tiresome; If more is needed, the listener can play it twice.